Gibson Roy Smeck Radio Grande Custom 7-String Model Hawaiian Acoustic Guitar, c. 1935, made in Kalamazoo, Michigan, sunburst top, natural back and sides finish, rosewood back and sides, spruce top; mahogany neck with rosewood fingerboard, brown gig bag case. This instrument is a unique example of the Gibson Roy Smeck Radio Grande 7-String flat-top Hawaiian guitar, with a possible provenance directly to the artist. It has been in the possession of a single family since before WWII, and the patriarch was a personal friend of Roy Smeck and a possible business associate. There is no paper trail on this provenance, however it certainly seems likely due to the 7-string layout. Whatever its background, this is a fascinating piece, certainly a custom-ordered instrument and likely one of a very few ever made in a 7-string layout. Roy Smeck himself generally used 7-string models as stage instruments, as documented in period films. Smeck personally owned at least one other 7-string Radio Grande model with a natural finish top, but it is not documented if that or any others survived. We have not been able to verify the whereabouts of any other identical 7-string models, but it is not possible to say this is the only extant example. 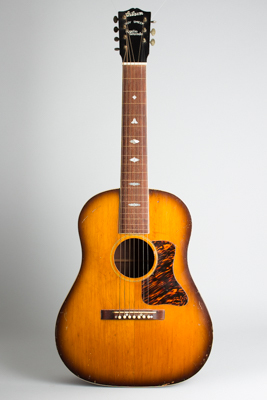 The Gibson company produced two similar model flat-top Hawaiian guitars bearing Roy Smeck's name beginning in 1934: the Radio Grande, priced at $100.00, and the Stage Deluxe, priced at $50. These were 6-string instruments built especially for Hawaiian steel guitar style, and not playable as a conventional "Spanish" guitar without extensive modification. By this time most professional Hawaiian guitarists were adapting to performing on the new electric Hawaiian guitars, making the flat-top acoustic steel guitar like this rapidly obsolete. The Smeck models were not sold in large numbers and Gibson no longer cataloged the Radio Grande after 1936, although scattered examples continued to be shipped through 1939. Total production is unknown, but it was likely not more than 100 instruments. Smeck maintained a relationship with Gibson at the time and a number of custom-ordered Gibson instruments were supplied to him in the mid-1930s, both for his own use and for the music school he founded. This particular instrument has some standard and several custom features and was quite likely built for Roy Smeck himself, either for his personal use or for one of the many students he taught. The headstock has a "Roy Smeck Stage DeLuxe" white paint stencil and is equipped with seven openback riveted Grover G-98 tuners of a style used primarily in 1935 and earlier. The very wide neck is built from mahogany laminated on the center seam as it is considerably wider than a standard Gibson neck blank. The bound rosewood fingerboard has inlaid fret lines (not conventional frets) and shaped pearl inlay in what is generally called the "Nick Lucas" pattern. The spruce top is finished in an unusual sunburst pattern seen on occasional examples of this model; the standard finish was a natural top. The back and sides are natural finished rosewood. This is one of the few large-body rosewood guitars ever built by Gibson, which adds substantially to the model's desirability. The bridge is wider than standard to accommodate the seven string pins, and the attachment is re-inforced by four screws covered by pearl dots. The Factory Order Number stamped in ink on the neck block of this guitar has faded into illegibility, so the instrument cannot be dated precisely. Based on the features, it was built between 1934-36, probably on the earlier side. This instrument has considerable historic value. However, the unusual 7-string layout with the very wide fingerboard and bridge would make conversion to a modern 6-string instrument for playing purposes practically impossible. While the primary modern collectors' interest in the Gibson Roy Smeck models is for instruments playable in the conventional Spanish style, this guitar is still an amazing piece of pre-war Gibson flat-top history. Overall length is 39 in. (99.1 cm. ), 16 in. (40.6 cm.) wide at lower bout, and 4 13/16 in. (12.2 cm.) in depth at side, taken at the end block. Scale length is 24 3/4 in. (629 mm.). Width of nut is 2 1/2 in. (64 mm.). The guitar survives in well-played but largely unaltered condition. Overall there are dings, dents, and scrapes to the finish, but the instrument shows no alterations except a replaced nut (Still Hawaiian height) and newer bridge pins. There are small grain cracks that appear to have been repaired visible on either side on the lower bouts by the back just above the kerfing and to the top on the upper edge of the pickguard. The guitar remains perfectly playable in its intended Hawaiian setup and has an extremely fine huge sound. It is housed in a more modern HSC with some fairly heavy wear. Excellent - Condition.